Shake with ice and pour into a tall glass. Fill with ice and garnish with a pineapple chunk speared to a green cherry. Two Fridays ago to continue on with the summer of Tiki, I reached for Beachbum Berry's Remixed after I got home from my shift. There, I spotted the Yellow Submarine from around 2002 which intrigued Andrea with its banana and chocolate undertones. 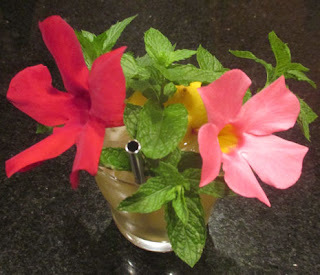 Once in the Tiki mug, the Yellow Submarine offered floral and mint aromas. Next, lemon and pineapple on the sip slid into rum, banana, more pineapple, and chocolate on the swallow. With the light touches of banana and chocolate and reasonably dry balance, the drink was more elegant than tawdry.